This week we are bringing you a surprise bonus post! 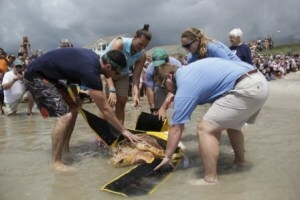 Enjoy reading about a sea turtle release we helped out with last week. 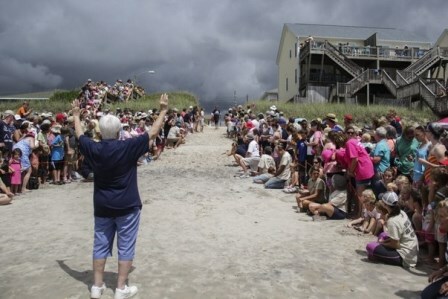 Jean Beasley, Executive Director of the Sea Turtle Rescue and Rehabilitation Center, greets the crowd of sea turtle lovers. 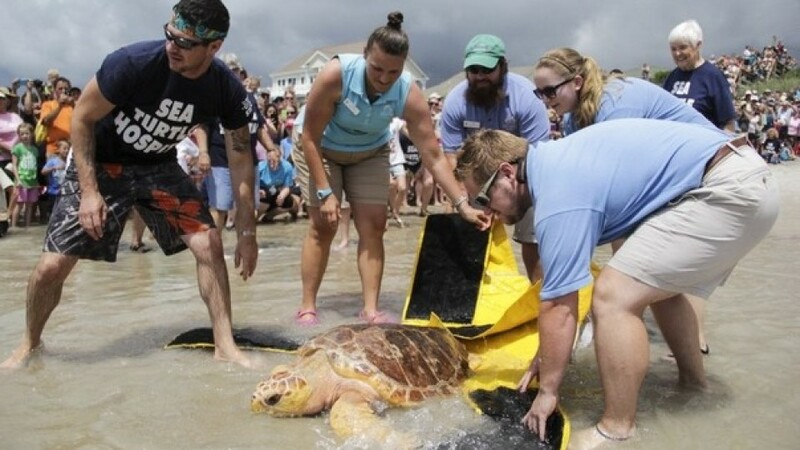 The NC Aquarium at Fort Fisher was honored to help with the annual sea turtle release with the Karen Beasley Sea Turtle Rescue and Rehabilitation Center in Topsail Beach. These sea turtles were found sick at sea for various reasons and were brought to the Center to be nursed back to health. 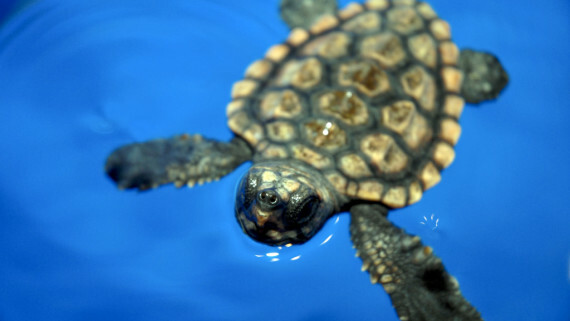 This event celebrates the success of the turtle’s rehabilitation and their return to the ocean. Their care and rehabilitation would not be possible without the the many dedicated staff and volunteers who work at the Center. 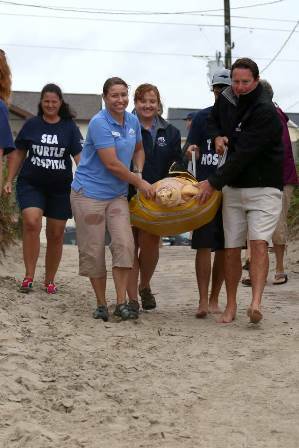 Aquarium staff carry Buxton, a Loggerhead sea turtle, out to the surf. Five sea turtles were released on Wednesday and six sea turtles were released on Thursday. Most of the turtles were Loggerheads, but there were a few Greens and even some Kemp’s Ridleys. The sea turtles were brought to the Center for different reasons. Some were cold-stunned during the winter months. You can read here to learn about our cold-stunned sea turtles we helped care for during the winter. Some were sick and found covered in barnacles which were weighing them down and prevented them from swimming properly. 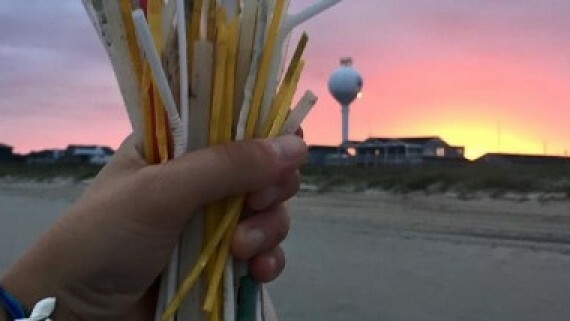 Many were harmed from human influence like boat strikes that fractured a shell, getting caught in a fishing hook or accidentally ingesting trash or oil. Aquarium staff help Coldie, a Loggerhead sea turtle, prepare for take off! The first sea turtle that was released was named Alpha, a Loggerhead that was the very first arrival to the new Karen Beasley Sea Turtle Rescue and Rehabilitation Center, which opened in the summer of 2014 after the hospital outgrew its original facility. Alpha was very sick and stayed in the care at the facility for almost two years. It was very fitting that she would also be the first one released last week to return to her home in the Atlantic Ocean. 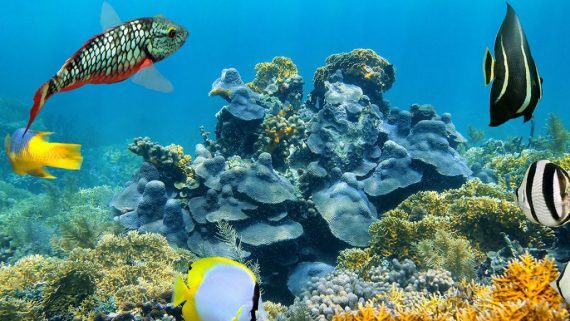 The annual releases are a big celebration for everyone and a great way for beachgoers to connect with sea turtles and realize we all can help take care of them by doing our part. Remember releasing balloons and not picking up your litter can harm sea turtles. 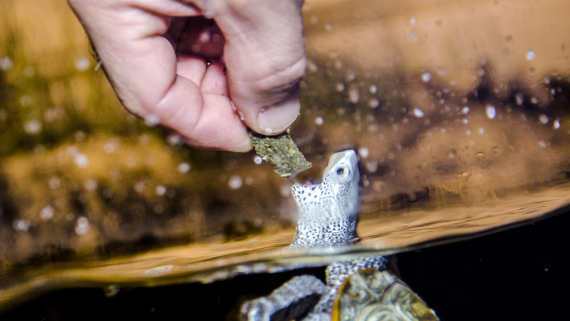 Read here how the turtles can be injured when ingesting plastics and trash. 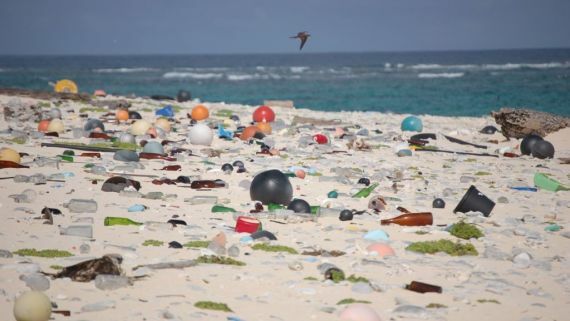 Even if you live hours away from the beach, you can still help by picking up plastic bags, bottle caps and other lightweight plastic so they don’t blow with the wind into a waterway and empty out into the ocean. When fishing, pick up after your fishing line and hooks and when boating, be responsible. We wish all of the turtles that were released last week a “bon voyage!” Check out the Karen Beasley Sea Turtle Rescue and Rehabilitation Center to learn more! Remember to refer back to last week’s Summer Vacation post to keep up with our hatchlings as they continue to grow during the summer!